While higher-level tools let you build things more quickly and easily, you're always trading giving up some control or performance in exchange. In many cases, this doesn't make a real difference. For example, Ruby is a much better language than C for creating a standard web app, even though C runs much faster on a computer. These performance differences rarely matter, especially when you're starting out. Now that you're using a high-level language, should you use a framework or code your app from scratch? 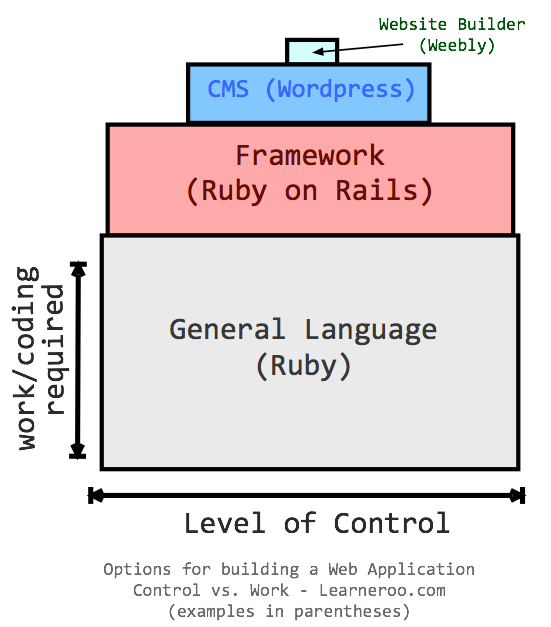 Back in the 90's people often coded from scratch, but in the 2000's frameworks like Ruby on Rails were developed. In almost all cases, you should go with a framework like Rails. They provide a standard architecture for building web apps and provide useful libraries and re-usable components that make it easier to develop sites quickly and according to best practices. The more ready-built components you can use, the better. Website builders make it easy to create sites quickly, but you lose control to do what you want. You get full control of the content of your site, and a fair amount of control of the look and layout, but you cannot control what your site does. You can pick from the provided options, such as wiki or blog, but you cannot develop your own features. If you're just creating a small standard site that fits into one of these checkboxes, you may as well use them. However, if you're creating a new type of application you'll need to develop it on your own. Large website will usually have custom needs, but you can still use website builders for a small site or to test out an idea. 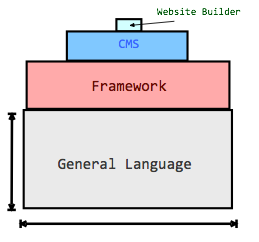 CMS's are in-between a website builder and a framework. They are used for managing content-based sites, such as for news or reference. The most popular one is Wordpress, which started as a blogging platform, but evolved into a platform for any type of content site. If you install Wordpress on your own web host, you will need to keep it up-to-date and secure, but you retain control over your application. There are a large number of plugins you can install on wordpress sites to add features without writing code, and you can develop your own plugins to add potentially anything. Wordpress is great if you're creating a site that fits with what it does. However, if you need to develop a custom application, Wordpress is rarely the best choice. Instead of designing an architecture that fits your application, you will need to deal with a large existing codebase that was built for a different purpose.